Find your Karmic Lessons and click on the corresponding links below to read their meanings. 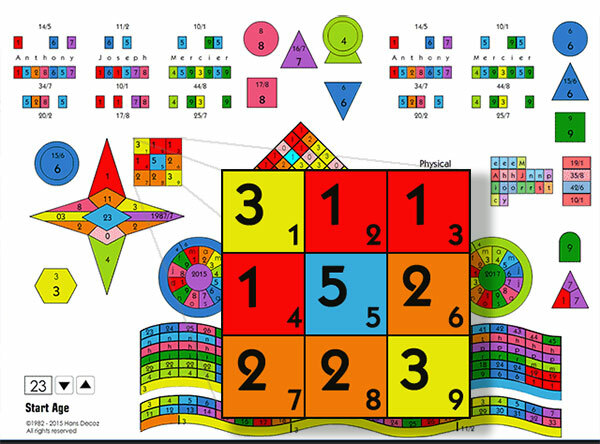 The Karmic Lessons and Hidden Passion chart in our free World Numerology software charting system is represented by a square divided in 9 smaller squares. Each of those nine squares is numbered 1 through 9 and arranged in order starting with 1 in the top left and ending with 9 in the lower right corner. In each square is another number indicating how many times the number below it is represented in the full name at birth. The letters and numbers of your name point to talents and abilities that you possess. These characteristics can be compared to a workshop in which certain tools are available to you. Missing numbers, those that are not represented in the letters of your name, imply tools that are unavailable and must be learned and mastered during this lifetime. For people with three or more numbers missing in their numerology chart, it is supremely important to focus on your career and talents, and to persevere in the face of any difficulty or obstacle. The kind of keyhole energy suggested by such a name gives you the ability to achieve great success in a specific part of life; but before such a success can be achieved, adversity must be overcome. Perseverance, therefore, becomes the key to happiness. You need to show more initiative in your life. You must learn to be more determined. The will needs to be strengthened. You will be forced to stand up for what you believe to be right. You will need to make your own decisions. You must learn to be more independent. Life will bring many strong willed people into your life with whom you will struggle. You will have to learn to assert yourself or be suppressed by these forceful people. This is happening so that you can learn to become more forceful and dynamic. Learn not to concern yourself too much with what others think. You may be to meek and timid. Learn to promote yourself. Work on your self-confidence, have more faith in your judgment and abilities. Overcome any tendency to procrastinate. The effect of this Karmic Lesson is diminished if you have at least one 1 among your core numbers (Life Path, Birthday, Heart's Desire, Expression, or Personality Number). Go on to read about: Your Balance number! You must learn to be more diplomatic and tactful, to stay in the background when necessary and sometimes to accomplish something without the need to be praised and rewarded. Learn to be part of a team. You must learn to be more sensitive to other peoples' needs and feelings. You will regularly find yourself in a situation where the only road to success is through patience and attention, requiring you to work closely cooperatively with others. The effect of this Karmic Lesson is diminished if you have at least one 2 among your core numbers (Life Path, Birthday, Hearts Desire, Expression or Personality Number). You are highly self-critical. Every time you find yourself at the center of attention, you manage to find something in your performance to be entirely inadequate or embarrassing. You have established an impossible standard of perfection as the only measure of your actions. You need to lighten up on yourself. Realize that you have within you a critical faculty that must be contained and controlled. Otherwise, it can prevent you from doing what you truly enjoy in life. You're too serious. Be more optimistic and cheerful, enjoy life as it was meant to be and share this joy with others. Life will put you in situations that require imagination and communication. You will be tested in these areas. You will be forced to face the challenge. Missing threes will often produce artists but their success requires much work and perseverance. The effect of the Karmic Lesson is diminished if you have at least one 3 among your core numbers (Life Path, Birthday, Hearts Desire, Expression or Personality Number). You feel confusion about your life's direction. You will have to establish a methodical and disciplined approach. You need to create a foundation for your life. Otherwise, you will feel lost and tossed about by change. You have trouble finding the work you do best. You tend to be somewhat impractical and disorganized. You look for the answers to life's problems outside yourself, rather than within. New jobs start off as The Answer, but do not have the same glamour for long. You quickly discover that the new work requires the same effort and perseverance, without the excitement you expected, which may cause you to give up too soon. Concentration and application need to be strengthened. The effects of this Karmic Lesson are diminished if you have at least one 4 among your core numbers (Life path, Birthday, Hearts Desire, Expression or Personality Number). You need to be more adventurous. You must overcome your fear of living. Take every opportunity to experience life: travel, see strange and exotic lands, meet new people, and have many new experiences. Broaden your vision, be more social. You must learn to embrace change. You will be required to adapt to new circumstances. Overcome your tendency to be rigid and inflexible. Your lesson in life is to learn to have faith. You will learn to flow with life, to adapt with the changes, and grow. You will learn a great deal through experience. The effects of this Karmic Lesson are diminished if you have at least one 5 among your core numbers (Life Path, Birthday, Hearts Desire, Expression or Personality Number). You have a major issue with commitment and responsibility to others. You have a hard time committing to marriage and other important personal relationships. You have to learn to show true emotion. You may feel isolated and alone, but do not understand why. The reason is that very often you form relationships yet remain heavily guarded, putting up a show of emotion without truly communicating affection or care. This can make the bond between you and others superficial. You must learn to establish sincere relationships. You will learn the importance of close friends and lasting relationships. You will learn to give and, when necessary, sacrifice. This is the one true way to true friendship and lasting love. The effects of this Karmic Lesson are diminished if you have at least one 6 among your core numbers (Life Path, Birthday, Heart's Desire, and Personality Number). You need to deepen your knowledge and talents in a specific discipline. You lack the will or determination to perfect yourself or a specific talent you possess. You must learn to be your own critic, without self condemnation, in order to bring your abilities to their full development. You will learn not to take things at face value. A superficial understanding of important matters will prevent you from experiencing the satisfaction of your true potential. The effects of this Karmic Lesson are diminished if you have at least one 7 among your core numbers (Life Path, Birthday, Hearts Desire, Expression and Personality Number). You can attract a considerable amount of money and even be a good business person, but you experience major ups and downs in your financial affairs, due largely to your lack of caution in handling your resources. You are highly independent and do not want to be told how to do things. You have great problems with authority figures. This stems from a kind of know-it-all attitude and stubborn behavior that prevents you from knowing your limits. You will have to work at knowing how to handle money. In all likelihood, you will attract enough of it, but it has a tendency to slip through your fingers. This Karmic Lesson forces you to learn your limitations, and the limitations of your resources. Learn to be efficient. The effects of this Karmic Lesson are diminished if you have at least one 8 among your core numbers (Life Path, Birthday, Hearts Desire, Expression, or Personality Number). You must learn to be more compassionate, tolerant, and understanding. You have to learn to identify with the trials of others. There will be times when you will have to sacrifice some egocentric ambition for the good of a particular project or some larger goal. You must learn to broaden your view of life. You have to see things on a larger scale. You do not realize the enormous potential you have in influencing your own destiny and that of others. Therefore, you hold back your efforts at helping people, or furthering a particular social cause. You have an issue with commitment to community or mankind. The effects of this Karmic Lesson are diminished if you have at least one 9 among your core numbers (Life Path, Birthday, Expression, Hearts Desire, or Personality Number).